you can see that many of these belong to the lovely margie of resurrection fern and speaking of stones, you should go check out her latest stone diary post, because it features the stones i sent her! 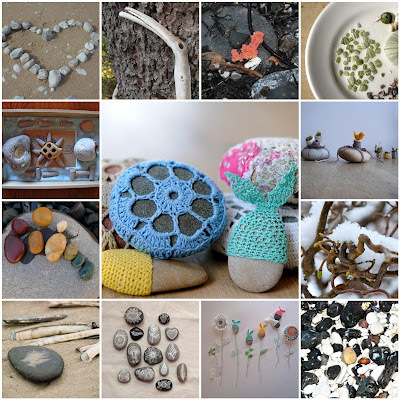 she's doing such inspiring work combining nature and craft. and i just read her profile and realized she's a family physician as well! i wonder how she finds the time for everything!?! people amaze me sometimes. and on that note, i'll get to work so that i can earn my time to play. 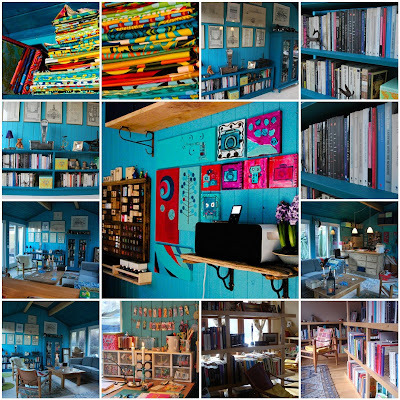 God that writing house is ENVIABLE! Lovely images as always ~ hope you have a good week! I particularly love the top set of photos. All those bright colours and paintboxes, makes me want to grab my brushes and start painting away. I've really noticed this too when I do my Thursday favorites mosaic. It's funny how I gravitate towards certain things. Great job at spotting this. 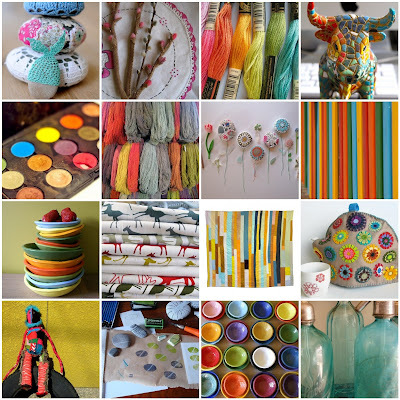 Oh I do love all those teals and aquas - and oranges and yellows! And stones! It was only through you that I knew about anyone crocheting or knitting covers for stones. For years when I was getting on a plane practically every week, I collected stones from wherever I went. They were the only thing small enough (and inexpensive enough) to fit in my luggage. These days it's become a security issue on airplanes, alas. But what a great collection of stones you have and the ones pictured here are fab too! I love the pictures! I am going to do a mosaic also as soon as I have time to be on the computer. So busy right now doing crafts! Still working on my stone needle basket. Crocheting another scarf, huge sassy crochet bag, knitting coffee cup sleeves. I need two of me to get all these things done. Those colors are so intense and fun. I forgot all about Big Huge Labs. That will be something fun to play with again and see what I can come up with. oh, i love your blog so much, i always leave feeling filled up to the brim with beautifulness. Fabulous collage...especially the first one with all the colors! I've got to try and do one of these photo mosaics. They're so delightfully pretty! I love all the color. These mosaics are beautiful and the colours are good enough to eat! hello julochka, thanks for your comment on my blog : ) interesting to see the mosaics from you flickr favorites and your own sets. i only just set up a flickr account yesterday so all the possibilities of flickr toys are new to me. i'm a big fan of turquoise and green/blue shades as well. ps: I was able to fill in the blanks on the tag you passed along to me. those mosaics are really beautiful! and the stones you sent to resurrection fern are awesome. must. MUST. visit moens klint when i'm visiting denmark again. i once found a rattle stone there, but lost it along the way. it was this totally round little stone, with another stone inside that. wish i still had it.